There are some yarns that no photo or description could ever do justice to … and this is one of them. It is soft, shiny, silky, has a bit of metallic sparkle, drapes beautifully, has just enough weight to it, and comes in 50 gorgeous hand-painted colorways. The metallic thread is not just twisted around one of the plies but is actually worked into them which means that it doesn’t get caught on your hook, needles, or other items. I didn’t have any issues with the yarn splitting either which was great to see. Most metallic yarns I’ve tried have a very obvious rough feel to them but with this yarn, you can barely feel where the metallic thread is. This keeps the piece soft and the metallic thread doesn’t detract from the feel of it. The yarn is lightweight but sturdy with some weight to it which gives a finished piece a good swing without feeling heavy. On Ravelry, the recommended knitting needle size is US 7 (4.50 mm) so I made my first gauge swatch with a US H/8 (5.00 mm) hook and got 18 sc and 22 rows in a 4″ swatch. 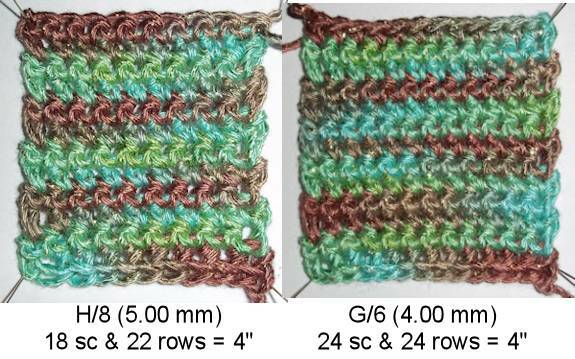 I also made a second swatch with a US G/6 (4.00 mm) hook and got 24 sc and 24 rows in a 4″ swatch. It was a little stiffer than the first swatch so it didn’t drape very well. Of course, I intend to make something that is lighter and lacier so I’m expecting it to drape more loosely. 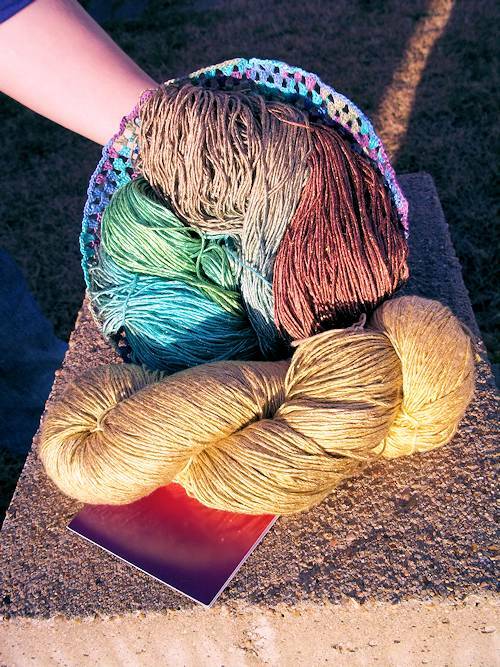 I received two colorways from Blue Heron Yarns, Harvest Gold and Turquoise. The Harvest Gold has subtle color runs of at least two shades of gold maybe more but it’s hard to tell. The Turquoise has 4 color runs of turquoise, a yellow green, copper, and brown. Both have the gold metallic strand running throughout. 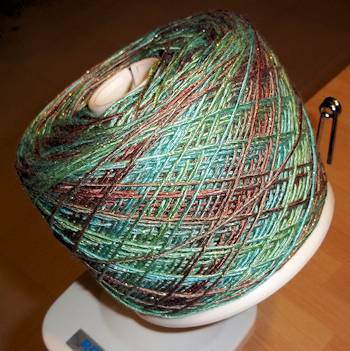 Each colorway has 550 yards in a 227 gram hank, more than enough yarn for a shawl or wrap. Each hank is $47 and can be purchased at your local yarn store, on the Blue Heron Yarns website, or on other sites that sell yarn online. If your LYS doesn’t have it, don’t hesitate to ask for it. I first found out about this yarn while at the Lucky Ewe Yarns in New Braunfels, TX (Kim Guzman was teaching a class there so I traveled an hour from Austin to say hello!) 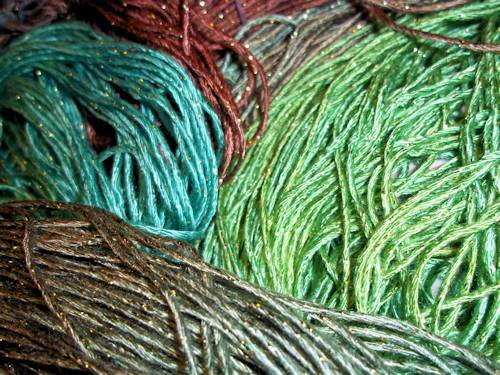 and mentioned to the owner that I was looking for gold metallic yarn for a very specific project. She handed me her swatch book from Blue Heron Yarns and told me I just might find something there and I did. Just seeing the color of the yarn and drape in the small piece in the book convinced me that it would be perfect. Once I received the yarn, I knew it was perfect. I’m hoping that the original project I was needing this yarn for will be completed for the next issue of Crochet Uncut so keep an eye out for it!